Turkey Vultures are expanding their range northwards, and that is why we’re seeing more and more every year. Bald Eagle numbers continue to increase, but are not as high yet as they were 100 years ago. The recent recovery of the Osprey is not readily apparent in DHBO’s numbers. The Northern Harrier count has been fairly stable over the last ten years. A decrease of Sharp-shinned Hawk numbers has been observed at many northeastern hawk watches. The Northern Goshawk is an irruptive species whose southward movements are closely tied with prey availability. Goshawk migratory peaks reflect lows in the population cycles of its chief prey, the Snowshoe Hare and the Ruffed Grouse. Cooper’s Hawk, Northern Goshawk and Red-shouldered Hawk all migrate around the same time of year – second half of March. The mid-nineties spike in all three species may be related to favorable March weather. The number of Broad-winged Hawks per season depends on favorable winds in the second half of April. A spectacular Red-tailed Hawk flight was recorded in the mid 90s. Since then, numbers have been around the 5,000 mark. The number of Golden Eagles recorded each season at Derby has increased over the years. To some extent the Rough-legged Hawk is an irruptive species whose numbers vary over the years. A cyclical pattern emerges that is probably related to prey species abundance. 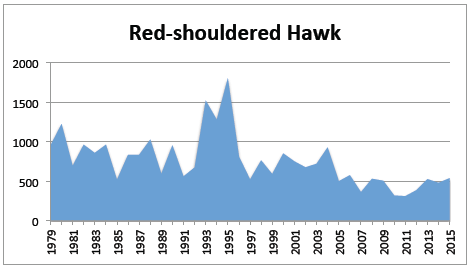 The Red-shouldered Hawk count has shown a very gradual decrease over the years. The American Kestrel is declining in the northeast. The 2010 count was the lowest on record, but numbers have rebounded somewhat. It is too early to speak of a trend reversal. Overall, Merlin numbers are higher now than they were in the 1980s and early 90s. The Peregrine Falcon has made a healthy comeback after near-extinction in the early 1970s. Numbers at Derby Hill fluctuate because this species is not funneled along the lakeshore as much as the other species.